Our Licensed Home Child Care program, the largest of all of our programs, has been in operation since 1972 and provides service to over 400 children on a daily basis. Our Licensed Home Child Care program offers families the option of child care in a safe and nurturing home setting. Families enrolled in our program enjoy flexible hours and varied age groupings, giving the opportunity to have siblings in care together. Our dedicated Licensed Child Care Providers, with the support of our professional team of Child Care Advisors, ensure children receive early learning opportunities in a stimulating environment that meets the Ministry of Education’s standard for safety and quality care as outlined in the Child Care and Early Years Act (CCEYA). At the Children’s Village, we work in partnership with both parents and providers to ensure the best individualized care plan can be developed for each child and family. Our qualified Child Care Advisors provide training and support to our licensed Child Care Providers to ensure a fun, exciting and developmentally appropriate program consisting of both indoor and outdoor activities for children in our care. 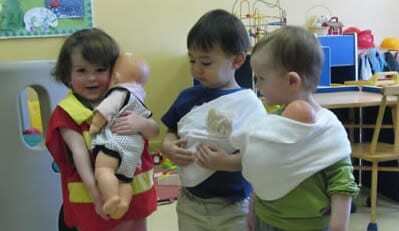 Our Licensed Home Child Care Program offers care in Ottawa, Nepean, Kanata and Orleans. Early Learning for Every Child Today used to guide programming and curriculum. Please click on the application below to apply and/or receive more information about Licensed Home Child Care options for your child. For more information on how to apply for Subsidy and what documentation and information is required, visit the City of Ottawa web-site.